Airbus will demonstrate a new pilot version of its real-time Virtual Reality technology at the Critical Communications World 2018 (CCW) in Berlin. Thanks to this solution, firefighters and police officers will be able to effortlessly carry out complex tasks from remote places through a secure communications infrastructure. In the future, Virtual Reality will help firefighters or police officers to enhance their missions and enlarge their range of actions. During the exhibition CCW, Airbus will simulate a scenario: a firefighter will wear a 360 degree camera in a metro station. From a command centre, an officer will virtually step into the situation. This Airbus solution, supporting this state-of-the-art technology, is based on the so-called Secure Mobile Virtual Network Operator (SMVNO) infrastructure. The basic idea of Secure MVNO is to provide secure and reliable broadband capacities, from network operators, to public safety agencies (police, paramedics, fire brigades). In addition, SMVNO and Virtual Reality features can be combined with other narrow- and broadband components of the Airbus Tactilon Suite portfolio. 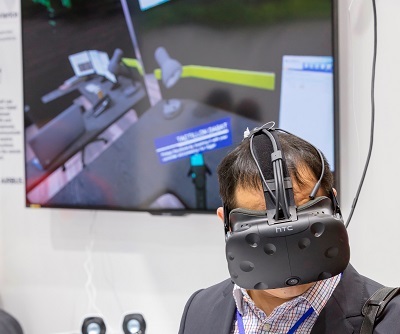 The latest Virtual Reality scenario will be showcased on the Airbus booth at Berlin Messe (C100, hall 22a, Messedamm 22, 14055 Berlin, Germany) from the 15 to 17 May 2018.